Two villages in the Singida region of Tanzania will collaborate with GWI and other partners in November to begin implementation of two pilot Sustainable Village Water Systems. Consisting of both water and the basic necessities needed to keep water systems sustainable (support for sanitation/hygiene, food production, and income generation), the pilot projects will serve an estimated 6,000 people who currently lack consistent access to clean water and improved sanitation. The centerpiece of a Sustainable Village Water System is a solar-powered water pump, which will be the first component of the system to be implemented this fall. The water unit will be owned and overseen by a village water committee as well as a district water engineer to ensure transparency and equitable oversight. The actual operation and maintenance of the water system in each community will be run by a locally selected water service entrepreneur, with a focus on supporting female entrepreneurs in this role. This private-sector water service model will serve as the prototype for a water franchise concept that GWI and partners have developed over the past two years. Installing the water pumps will also give the project’s hydrology team the opportunity to take a snapshot of the geology and potential pockets of groundwater underlying each village site. This data, along with continuous monitoring at each pump, will help the hydrology team build a working model to sustainably manage water resources at local and regional levels. Funding for the project comes from all of these partners as well as the Chris Long Foundation, whose Waterboys initiative recruits NFL players to raise funds and awareness for solving water access issues in Tanzania. The villages are part of a group of 125 communities designated by Tanzania’s Ministry of Water and Irrigation as urgently needing improvements in water access. GWI’s efforts to validate and scale up the Sustainable Village Water Systems model are based on a game-changing agreement with the Tanzanian national government. This agreement will allow us to successfully implement Sustainable Village Water Systems in 125 villages, and the national government will make available resources for water retrofits in 5,000 communities. The agreement is in the form of a letter of intent signed by three national administrative units (the Ministry of Water and Irrigation, the Ministry of Energy, and the President’s Office for Regional Administration and Local Government) with Ohio State in 2015. We are actively looking for motivated faculty and students to work with local collaborators to learn more about local needs, fill knowledge gaps, and design better solutions. Interested in getting involved? Please contact Rebecca Gianotti (faculty), Nathaniel Kramer (student), or Marty Kress (partner). See a one-page fact sheet (bilingual English/Swahili): What is a Sustainable Village Water System? 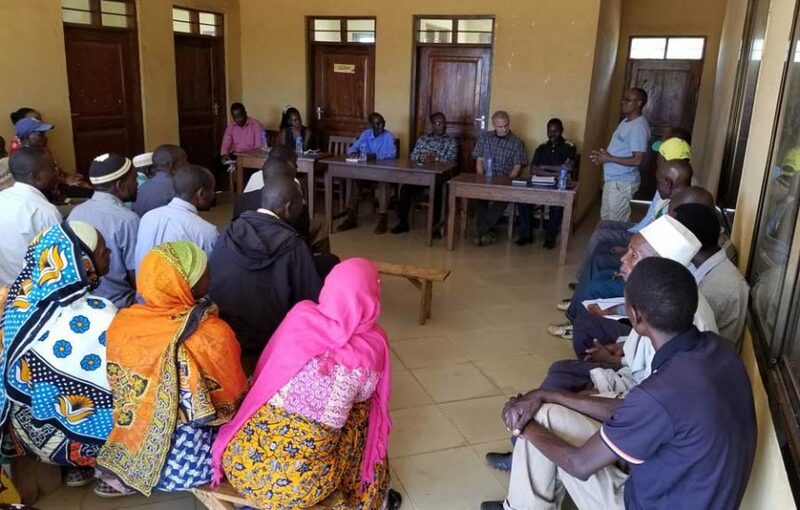 Photo: Members of the village of Mughanga, Tanzania, met with representatives of the Ohio State-led consortium in November. Mughanga is one of two villages collaborating with the Global Water Institute and partners to implement Sustainable Village Water Systems this fall. Source: Rebecca Gianotti.